2016 was the hottest year on record. The polar icecaps are visibly melting at an alarming pace and sea levels are starting to rise, threatening major coastal cities around the world. Resilience is on everybody's mind and many governments are actively thinking about how to deliver on commitments made at the UN COP21 Paris conference. Insurance and a proactive, holistic risk management approach are essential tools for cities and governments to protect and provide opportunity for their citizens. As such, resilience strategies cannot address climate change alone – factors like the wealth gap, sustainable green growth and sustainable infrastructure development must also be addressed. Latin America is one of the world's most urban continents with 80% of its population living in cities and almost one fifth of these in shanty towns. Devastating flood and drought events have increased significantly because of climate change. This will deepen the vulnerabilities already apparent in critical infrastructure and the economy and, in turn, undermine social stability in particularly risk-exposed urban settlements in Latin America. We need look no further than the torrential rains which have caused suffering for many in Peru and more recently in Colombia. With flash floods and mudslides washing away critical roads and bridges, many lives have been lost, with people are stranded and cut off from essential services. Unable to get back into their homes and maintain their livelihoods, families sink further into poverty. Argentina, like Peru and Colombia, has increasingly suffered from the effects of climate change in the form of floods. Today, one in three people live in areas highly exposed to flooding – that's more than 14 million people across the country. Furthermore, 15 of the top 25 industrial parks in Argentina are located in flood-prone areas. Besides the threat posed to the lives and health of the population, the estimated economic damage is also severe, amounting to about 0.15% of its GDP linked to flood-related events alone. While this may seem like a small number, it adds up to a total economic loss of around $700 million a year. Santa Fe, in the north-east of Argentina, has been hard hit because of its situation near the junction of two of South America's major waterways: the Paraná and Salado rivers. Severe floods in 2003 and 2007 – and this year as well – have highlighted the city's vulnerability, both in terms of physical devastation and the tremendous impact felt by its poorer communities. In order to try and reduce future consequences and help the city and its people get back on their feet more quickly, Santa Fe has become a member of the 100 Resilient Cities initiative and has recently appointed a city resilience officer. As part of its resilience strategy Santa Fe has joined forces with provincial and national government agencies to improve the maintenance of its water management system. The city is also working hard to improve communication, education and community awareness around risk prevention. Importantly, public sector officials in Santa Fe have recognized that resilience planning can also help to reduce poverty and income inequality. Disasters disproportionately affect low-income populations and, as a recent Inter-American Development Bank study notes, risk management directly improves the resilience of welfare programmes and social safety. This encourages cities like Santa Fe to take on both disaster protection and the wealth gap. 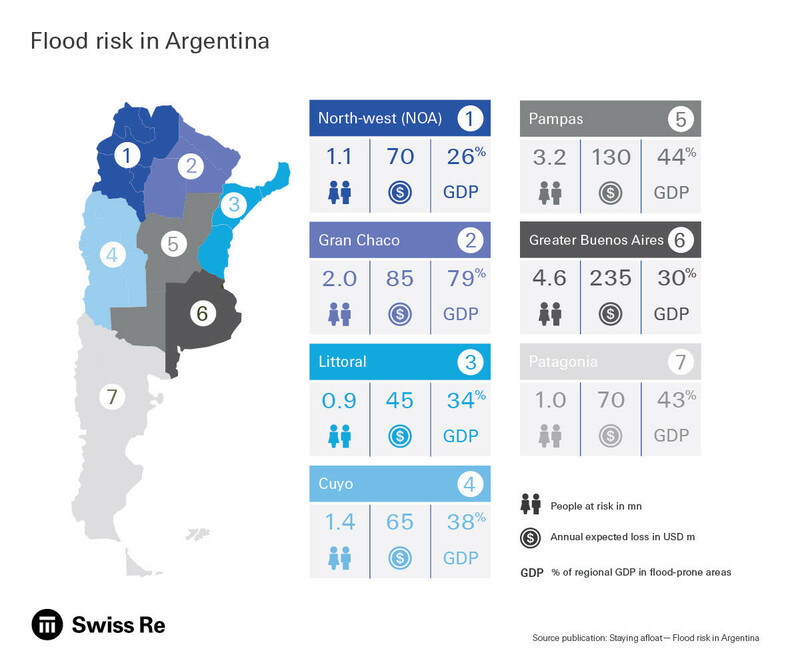 In a recent study conducted by Swiss Re, Flood Risk in Argentina, a majority of shop owners interviewed said they consider flood insurance, combined with private savings and governmental subsidies, as a valuable means to overcome the financial burdens brought by a flood event. Yet, up to now, there has been no meaningful flood insurance product available for small and medium businesses in Argentina. The protection gap for floods around the world is already large and continues to grow. With the technological advances, knowledge and tools available to the insurance industry today, the creation of a private flood insurance market is a resilience opportunity. Recent examples where governments in other parts of the world have taken steps to improve flood resilience are Flood Re in the UK and the revamped National Flood Insurance Program in the US. Essentially, there is a strong business case for governments and cities in Latin and Central America and beyond to consider insurance as a tool in their efforts to effectively improve disaster and climate resilience. Collaboration is the most effective way to drive our common effort to shape a more resilient world and break the nexus between extreme weather and extreme poverty.